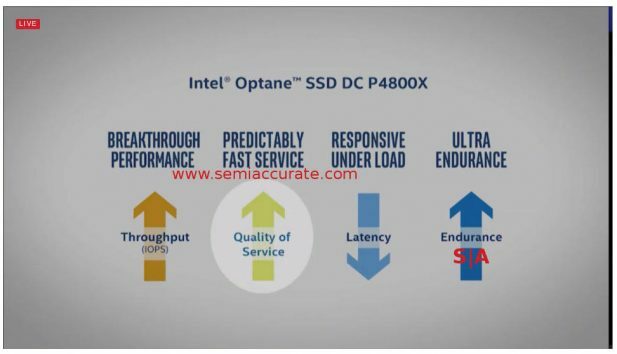 Intel’s Xpoint/Optane still doesn’t work but you should buy it anyway according to Intel’s webcast. SemiAccurate had to sit through it to hear they also launched two new SATA SSDs as well. Lets get to the good news first, Intel has two new SATA SSDs that they somehow forgot to brief us on. Again. They are the DC S4500 and S4600 lines, the former being read optimized, the latter being write optimized. The S4600 goes up to 1.92TB and, well, that is all the info they gave us. If you want expensive, middle of the road SATA flash SSDs, look no farther than the Intel S4500 and S4600. Then there was Xpoint/Optane, a painful 30 minute ‘webinar’ that had chirpy case studies about people using the technology to do the usual curing of cancer, solve impossible problems, and make VR awesome. Intel glossed over the crippling issues of the technology though, but did restate the ‘benefits’ without the farcical numbers of the past. We won’t go over how the numbers are presented again, today was just a softer approach than last time. That said we will point out that the Apache Pass DIMM format that was supposed to debut last year is now set for 2018, maybe, and will not be on Purley as SemiAccurate exclusively brought you. You may see it on Cascade Lake but don’t hold your breath for the endurance to be anywhere close to functional by then. Yes we know the webcast had a ‘client’ who said Xpoint had great endurance but for some reason the Xpoint drives have a programmed self-destruct when you reach the rated endurance numbers. No clue why such awesome endurance Xpoint/Optane drives would need a kill switch but I guess SemiAccurate is missing something the ‘not paid’ presenters know about. Someone has to understand how these two disparate facts can both be true, but that someone is not the author.